What Are Floating Worms? How Do You Rig Them? When And Where Are They Fished? Ask any angler these questions about how they fish floating worms and I'll bet you get many different answers. Why? Because there is no one answer to this question. 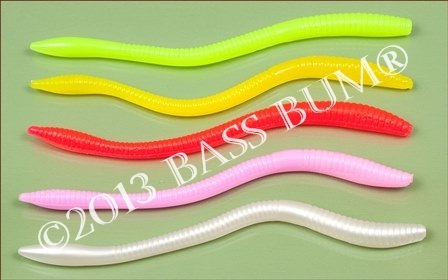 Traditionally, a floating worm rig consisted of a straight worm six to eight inches long in bright colors such as white, yellow, bubblegum or Merthiolate (fluorescent orange). This worm was rigged on 12-14 pound line with no sinker and a 3/0 - 4/0 wide gap hook rigged Texas style on a baitcasting outfit. There is no doubt many bass anglers still fish this version of the rig with great success. But like so many other techniques this one has also evolved over recent years. When is the best time to fish a floating worm? Though these worms can be fished year round spring is by far the best time of year for them. The bass are shallow in spring and this is a great shallow water lure. Floating worms are at their best in shallow, clear water. What type worm is a "floating worm"? I've long thought the best worm for this technique to be a straight, 6" Zoom Trick Worm. That's what I've fished for years. When lightly twitched it darts, rises and falls producing excellent, attention getting action. Other worms I particularly like are the 7" Gambler Floating Worm in White Lightening color and Z-Man's Floating WormZ in Pearl. Due to their buoyancy I've found these worms to fall agonizingly slow even on a 3/0 wide gap hook, exactly what I want them to do. When twitched they displays fantastic action darting, wiggling, slithering, rising and falling. Almost all soft plastic companies make some form of worm that is considered "floating". I rig these on size 1, 1/0 or 2/0 wide gap hooks. I use traditional bright colors as well as more natural colors like watermelon, green pumpkin, pumpkin and watermelon seed. I cast these right into flooded willows, skip them under overhanging cover and cast them beside isolated shallow water trees and bushes. How are floating worms rigged? As pointed out the basic rig is a 6" to 8" straight-tail worm rigged only on a hook without swivel or sinker. Hooks are generally wide gap. Their size depends on the size of the worm. For 4" worms it's best to use a "thin wire" 1, 1/0 or 2/0 wide gap hook. 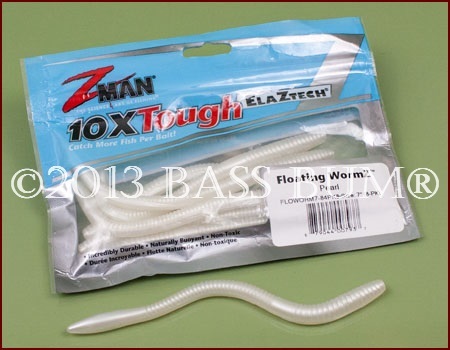 For longer worms 6" to 10" go with hooks 3/0 to 6/0. It's best to pull the head of the worm completely over the hook eye and knot. The worm will work through branches and leaves much better that way. Skin hook the point to further make it weedless. Since floating a worm is notorious for twisting line it's best, in my experience, to use a small swivel and an 18" leader. The leader can be mono, which floats (first choice), or fluorocarbon, which sinks. Though usually fished without any weight other than the hook and a swivel, you can add a small split shot (go no bigger than a #7) just above the swivel if you want the worm to fall faster. Does size matter, when it comes to floating worms? Size is primarily a matter of personal preference and whether your going after largemouth or smallmouth. As I've said, bass anglers, me included, use worms from 4" all the way up to 10". Just make sure the worm you use has greater buoyancy than that of a normal worm. Some make a big deal out of color. Is it? This is a topic of much debate. The bright colors have always been favorites. There are those who swear the bright colors provoke more aggressive, vicious strikes than do more natural colors. I'm not sure about that but, they are easier to see by the angler and that's part of the fun in fishing a floating worm. After all, it is a semi-topwater technique. With this technique you will often see the bass approach to and take of the worm. The bright color aids you in knowing the bass has taken the worm when it suddenly disappears from sight. When that happens don't immediately set the hook however. You'll miss her and likely be ducking a worm flying by your head. Feel the bass first, then slam her! It's arguably important to have several colors available so they can be alternated in an attempt to identify the bass' preference on any given day. You might also want to have a "follow up" bait rigged. Bass will sometimes only nip at a floating worm or suddenly turn off it completely. A lizard or tube is a good choice to throw when you realize this has happened. How do you fish a floating worm? Here's one way. Cast the worm as close to your target as possible. Let it "slowly" sink though sometimes it will be taken as soon as it hits the water. If no strike occurs let it sink and rest on the bottom for a few seconds. Then "lightly" twitch it, not jerk it, trying not to move it more than 6" to 10" at a time. Another way is to fish it fast by strongly twitching then reeling, then letting it fall till you can't see it and repeat. Repeat this process. Yet another is to twitch, pause, twitch pause over and over. Move the worm 12-18 inches with each twitch. This keeps the worm moving and appeals to aggressive bass. With a floating worm being a shallow water lure you will most likely catch all fish in a zone from the shore's edge to no more than 5-10 feet out from the shore. So with any retrieve once your 10' from shore you may want to quickly retrieve the worm and cast again rather than work it all the way back to the boat. What is the best gear for floating worms? Though some prefer baitcasting gear for this presentation the preference among bass anglers is for spinning gear. In spring bass are indeed found shallow but they are also often far back under cover like overhanging bushes and limbs of small trees. Getting lures to these bass is difficult unless you can "skip" a bait to them. Skipping is difficult with baitcasting gear but spinning gear seems made for it. Baitcasting Gear - A 6' 6" medium action baitcasting rod with a medium size reel is preferred by some anglers. They feel this gives them better long distance accuracy which is very important when fishing clear, shallow water, especially if fishing points and grass edges. The rod and reel will be paired with line between 8-14 pond mono. Some use braid as an alternative as they feel it gives them a better chance of landing a bass that they've hooked in shallow cover. 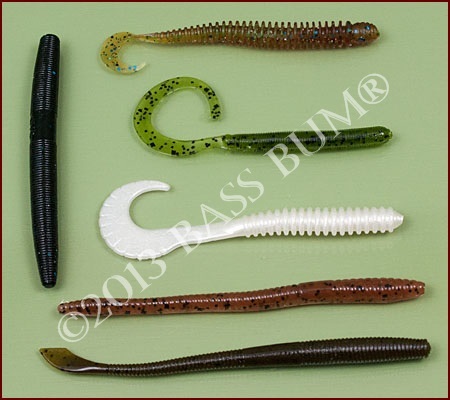 Worms in bright colors that are between 6" and 10" are rigged on 3/0 and 4/0 wide gap hooks. Spinning Gear - A 6' 6" medium action spinning rod is a good choice for it allows an angler to use a "whipping" action to propel a worm skipping across the surface like a rock to reach far under cover normally unattainable. A stiff, heavy action rod will not accomplish this nor can an overhand cast. The shorter 6' 6" rod provides better cast control than does a longer rod. It's also best to not use a very limp rod for the control and whipping ability of such a rod is not good for skipping. When picking a reel it is arguably better to avoid a high speed model in favor of a medium speed, say 5:1:1 for example. Why? Because a high speed reel will take up too much line and move the worm away from the cover too quickly. This eliminates the effectiveness gained from twitching the worm while keeping it in the strike zone of the bass. As with baitcasting gear, worms from 6" to as long as 10" can be used. Monofilament line that is 10 or 12 pounds works well. Alternatively, you may want to use fluorocarbon line which will enhance the "drop" of the worm since fluorocarbon line sinks.